STOMP’s record twenty-three years of mind-blowingly brilliant runs on Broadway and twelve equally remarkable blockbuster years at the West End has done absolutely nothing to exhaust its original chaotic allure and energetic charisma as the guaranteed riotous romp of a theatrical experience to beat. As its kinetically-charged repertoire returns with an even louder and bigger bang to the Cultural Center of the Philippines’ Main Theater from June 17 to 22, 2014, it brings along with its return, fresh and riveting routines—plus a few more revelations. STOMP’s relentless appeal, made even more exhilarating with generous doses of sinfully delicious shots of side-splitting physical comedy, pushes the boundaries of creativity with a fluidly evolving repertoire that turns the everyday humdrum object and mundane activity into a combination of sophisticated musical/percussion performances and vigorous callisthenic-like exhibitions. What’s more excitingly fresh with STOMP’s 2014 Manila comeback—apart from the amazing new numbers introduced late last year—is that audiences will also have the exclusive opportunity to witness the rhythm of STOMP let itself go crazy-loose onstage “Filipino Style,” when the touring cast is joined this time by 17-year veteran Filipino Stomper Andres Fernandez. In a long overdue, ‘23-years-in-the-making’ big, bad homecoming, Fernandez will be joining STOMP’s special 8-day limited run in Manila as it continues to break theatrical conventions of music and lyrics in a high-adrenaline show drawing “pure stage magic” from ingenious combinations of slick movement and pulsating rhythms. “I’m just so extremely excited, I can’t wait to get back—it’s the first time since Christmas of 1991 since I last visited, promoting my brother’s album Puede Ba which was recorded in the Philippines” shares Hawaii-based Fernandez, whose touring performances in the Hawaiian Islands with his big brother Johnny (1999 Miss Saigon US tour alumni) included special appearances as opening acts for Filipino music luminaries Gary Valenciano and Martin Nievera. With a wordless yet visually wild and witty repertoire, STOMP’s polished theatrical thrills continue to draw in audiences of all ages and backgrounds while still managing to nurture performers, who after long years of stomping, still find it hard to contain their original passion and excitement for the show–such is the case with Fernandez, who has also added the Rehearsal Director title to his catalog of roles in the Lincoln Theater run of STOMP in its 2012 US tour. 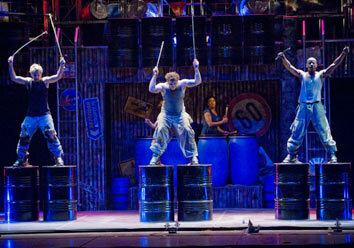 According to the New York Times, “STOMP is as crisp and exuberant as if it had opened yesterday,” and this 2012 review could not be truer now more than ever, as two new routines introduced in 2013 join STOMP’s trademark gallery of industrial percussions which range from brooms to garbage can lids and paint canisters; and newspapers to portable kitchen sinks. The new routines, “Frogs” and “Trolleys” explores the bizarre possibilities of creating an astonishing array of rhythm and sound from a variety of plumbing fixtures and a fully-laden supermarket trolley, respectively. “One of the new numbers, Trolleys—it’s also called Shopping Carts—I love that number! When the music actually kicks in it’s just like ‘Oh Man!’ it’s such an amazing number!” says Fernandez. Fernandez, born to a Kapampangan mother and a Visayan father, has had the rare chance to swing from one role to another in STOMP’s US touring production—ultimately and rightfully earning for himself the bragging rights of having played all 8 irrepressible characters in the internationally sensational show. “I’m not really sure yet what role they’ll have me do in the Manila production… When I went on the European tour last summer, I did the lead role—the guy that starts off the whole show—he’s a character called ‘Sarge’, as in Sergeant ‘coz he’s sort of in charge of everybody,” shares Andres, who confesses to having a “little more fun” doing the comedic characters of STOMP. The show’s high-octane audio and visual spectacle—sure to challenge die-hard dance and fitness fanatics with the raw stamina of each routine and the physical endurance required to master its tight ensemble work—will also prove to be motivational to those who are prone to living lethargic or even stressful lives (bookworms, tech-savvy students of all levels, and even corporate workaholics). “We get onstage and bang around and try to look so cool. No one knows we're actually letting off steam,” shares Fernandez. Throughout its years of critically acclaimed world tours, mesmerizing over 15 million people in 53 countries across 5 continents, the “STOMP experience”—with its deceptively gritty, and electrifyingly precise dance of carefully engineered chaos—has become embedded into the psyche of modern cultural iconography. A constant reminder to audiences that feel-good, vigorous rhythms (coupled with adrenaline-pumping choreography) can easily cross boundaries of musical and theatrical preferences. And, that there is so much more to life than just stopping and smelling the roses. So why just settle for simply stopping and smelling when you can also feel the rhythm of living and along with it, start Stomping? Come and see what all the noise is about! STOMP will be playing for a limited season 17 June – 22 June 2014 at the CCP Main Theater. Presented by Lunchbox Theatrical Productions and Concertus Manila. For tickets to STOMP, visit Ticketworld Online or call Tel. No. 891-9999. Get updates via our social media sites www.facebook.com/ConcertusManila and https://twitter.com/ConcertusManila.